TOKYO –Nikon Corporation is pleased to announce the introduction of the DX-format 35mm single-focal-length lens AF-S DX NIKKOR 35mm f/1.8G, which offers a picture angle equivalent to a focal length of 52.5mm in FX and 35mm formats. 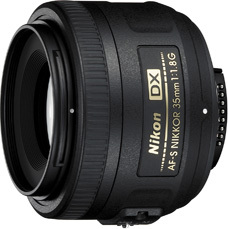 The AF-S DX NIKKOR 35mm f/1.8G is the first single-focal-length lens with a normal picture angle developed exclusively for Nikon's DX format. It is a compact, lightweight model that achieves the high reproduction performance unique to single-focal-length lenses at an affordable price. This lens is most suitable for natural portrait and landscape shooting. Note: Although DX NIKKOR lenses can be attached to 35mm film and APS cameras, they cannot actually be used with them due to their small image circle. When the lens is mounted on a Nikon FX-format digital SLR, with the image area in the shooting menu set to Auto DX crop (default), DX crop is selected automatically.